Shannon is a Forge colleague, and when I read her amazing first book, I knew were we soul mates, too. Then Jess and Shannon met. And they teamed up to become the power sisters. Seriously. They are a force of nature. And now, with shelves of their individual books between them, they are once again taking their show on the road. And their sisters at Jungle Red are welcoming them with open arms, champagnes, and…fear of the dreaded mogus. SHANNON BAKER: Good morning Reds and everyone. Thanks, Hank, for inviting Jess and me for a stop-over on the Lourey/Baker Double Booked Blog Tour redux, in which we get to mention our upcoming releases, but more importantly, settle in for a good visit (as my grandma would say). Virtually traveling with Jess is more fun than a person can have without a prescription. 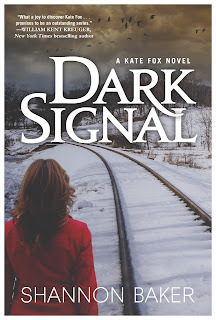 I’m Shannon Baker on the road to peddle Dark Signal, the newest in the Kate Fox series, where it’s murder by railroad tie. 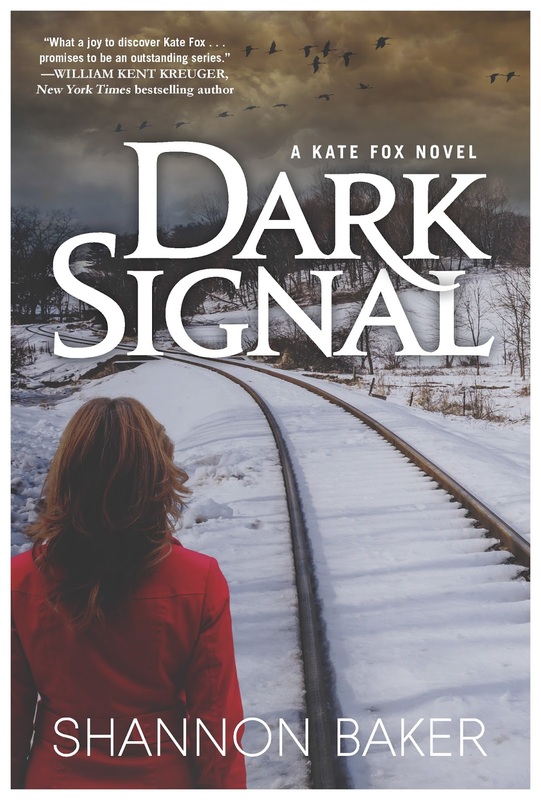 Forge is releasing a .99 Kate Fox short story September 17th, but at the time of this writing, I don’t have a link, so I’ll put it in the comments. 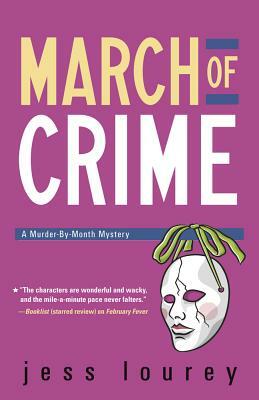 Jess Lourey is announcing the ever-hilarious installment in the Murder by Month series, March of Crime. Shannon: I recently ran a half marathon. It was my first. I’m 57 years old. I’d kind of always wanted to run a ½ marathon, but the idea of actually racking up 13.1 miles seemed so far outside of my abilities (and the bounds of sanity), I didn’t ever try. Jess, when was a time you challenged yourself to do something you thought might be outside your abilities? JESS LOUREY: First, can I say how thrilled I am to be here? The Reds are amazing women, and I count two of my favorite people among them: Hallie and Hank. JESS: Mwa-h. So My 2016 TEDx Talk, and the book it inspired, Rewrite Your Life: Discover Your Truth Through the Healing Power of Fiction, were so far out of my comfort zone that I’m still finding my way back. Both deal with the transformative power of turning your facts into fiction. The thing is, I don’t write memoir for a reason. I like hiding behind stories, and I had to drop my fiction fig leaf to share the process with others. I am glad I did, but I’m still dealing with the psychic terror. Shannon, congratulations on the half marathon! How’d you do? Did you have special equipment? And why in the name of all things lazy did you do it? Shannon: A couple of things inspired me to run the race, not least was proving to myself I wasn’t too old to try new, fun things. Once I convinced myself it might be possible and even enjoyable, I immediately signed up for a race three months down the road. I invited my daughter (who had talked about wanting to run a ½ marathon…someday) and her fiancé to take a trip from Portland, OR to Tucson and run it with me. With that, I was set-in-cement committed. Shannon: As you can imagine, you don’t just wake up one morning and run 13.1 miles. I found a training schedule that would take me to race day. And I stuck with it. The first week my big run was only 6 miles. And the next week, 7 didn’t seem so hard. The week I ran 10 miles nearly blew me away. Ten miles! Me? No way. After that, adding one more mile a week didn’t seem insurmountable. Jess: Hmmm. Does it count as exercise to drink beer while I read about you training for a marathon? Because that bottle isn’t making its way to my mouth by itself. Also, you make this whole training process sound pretty smoo—oooth. Jess: What is a dread mogus? Also, rock on with that quote. I’m going to talk politics here, and I’m going to keep it simple: women are capable, women are amazing, and it is our time. Boys are welcome, too—some of my favorite people are male—but it’s long past time to shake up the system. Back to our regularly-scheduled programming: Shannon, after you peturped (I can make up words, too) the dread mogus, what’d you do? Shannon: My daughter and her fiancé flew in, we carbo-loaded and bought new running clothes, although my almost son-in-law only opted for new socks. Then ran the race, in much better times than any of us believed we could, and I basked in the glow of that accomplishment. Jess: Well-deserved. I felt the same way after my TEDx Talk, and when the backstage pass I kept from the event snags my eye, I feel a tiny purr of that wonderful “I did it, you guys I did it!” feeling you earn when you Do the Thing That Is Hard. And what that thing is differs for all of us. For me, the combination of sharing personal information I’d kept hidden for over a decade, public speaking, and standing on the revered TEDx red circle was so terrifying for me that I woke up at 2:00 am the night before my Talk, sweating cold, realizing that I’d been gone for three days and hadn’t asked anyone to feed my cat. I was on my phone, crying, scrolling through my contacts to see who I could call to see if my poor kitty was even still alive, before I realized I don’t have a cat. I learned something important about myself, and the world: we were put here to push our boundaries. All the good stuff is on the other side of Uncomfortable I Don’t Wanna. Shannon, what were your takeaways from the half marathon? Shannon: Through this, I learned that a mile can be really far, or hardly any distance at all, depending on where I focused my attention (and what was on my playlist). Any big chore can be tackled by breaking it into chunks. Commitment and accountability are key. And whatever the journey, find comrades to share, commiserate, and celebrate. Jess: Love it. As in running, so in life. Shannon: I admit that a few days after the race I felt let down and wondered if I ought to schedule another race and see if I could better my time. But running is not my passion. Writing is. Jess: That’s so interesting that you say that. 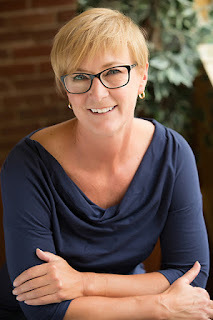 A while back I started a writing retreat business because I was searching for something that I apparently wasn’t getting with my full-time teaching, writing two novels a year schedule. After five months and hundreds of hours and thousands of dollars invested, I realized I hadn’t been running toward something. I’d been running away from writing. I’m back, and remind me this is where I belong, yes? Reds and readers, what have you faced and conquered? JESS AND SHANNON: Yes, there's more! We are each giving away three books on the Lourey/Baker Double-Booked Tour. For every comment you make along our tour stop, you’ll get another entry in the contest. We get lonely if you’re not talking to us. This is our last stop but we’ll count if you check out our other visits. Congratulations, Shannon and Jess, on your latest books. I am in awe . 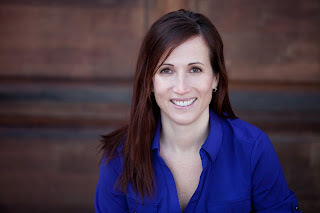 . . half marathons and a TEDx Talk . . . that’s setting the bar pretty darn high. Cheers for your successes, ladies! Faced and conquered? Nothing earth-shattering, but sometimes even the smallest success seems huge. Considering that I hate driving and I can get lost going around the block [no exaggeration], successfully undertaking a by-myself trip of some three hundred miles without becoming one of the permanently missing was a pretty awesome feat for me . . . .
Hank here: Yay, Joan. I am so with you on driving..so I applaud you like mad! Joan, it's the small successes, it really is, so way to go! And thank you for stopping by to hang out with us. I pretty much had to rebuild my life from the ground up after my husband died. Some days it was the hardest thing ever just to get the trash out in time for pickup. But, as you suggested, Shannon, if you break any task down into tiny steps, then you can always take one more tiny step, and eventually you get someplace interesting. I had forgotten what it was like to be single, in the sense of "who am I if I don't have to make compromises to fit into a couple?" Going all the way back to who I was at 25 and unearthing old dreams I'd stashed along the line was a challenge. I discovered that, after a while, living out there on the far edges of my comfort zone became a lifestyle itself. You find you're capable of a lot of stuff you never thought you could do, and you figure out that you're kinda cool when you rise to meet whatever the challenge is. So, Joan, I salute you for your 300 mile trip. That took courage and tenacity. And I raise you my upcoming trip: nearly 2,000 miles to North Carolina and back, to pick up a leaded glass window I commissioned from artist friends. You may not want to spend four days in a minivan with a dog, but I'll bet there's something you do want to do that's just as hard as driving that 300 miles. Do it. I, personally, can't wait to get on the road. Gigi, your story is inspiring. I'm thrilled you are living a whole life! Thank you, Shannon. Early on, I had to keep reminding myself that Warren was the only one who died, but I had a profound negative example. When my parents got divorced, my mother kept saying that she would never get over the pain of it, so she never did. I was about the same age when Warren died, but I did not want to be trapped in a place of pain and grief the way my mother trapped herself. That forced me to look for ways out, and opportunities to build a new life "after." For me, it started with music. Warren and I had loved and shared so much music, but after he died that old soundtrack only made me dwell on what I no longer had. I started seeking out new music. It hurt that I couldn't share it with him, but different soundtrack = different scene, right? Or, at least, a new chapter in the story as time moves forward. Jess, in her TED talk, is absolutely right: telling your story helps you gain perspective on it, and makes the lessons clear. Gigi, thanks for this. I really needed to hear your story today! Hugs to you, Julia. Glad I could help. Ask Debs for my contact info, if you ever want to talk. I'm holding you in my heart. Gigi, thank you for sharing that. I loved the wisdom and heart of it, and this: "unearthing old dreams." It's sad and beautiful and true that that is what we have to do--if we want to find joy again--after losing a partner. Big love to you and your courage, and good luck on your road trip! I understand! Anytime I make a successful road trip, even if it's to the grocery store, I consider it a minor miracle! Jess, Mwa-h backache! Shannon, Jess - You guys are great! But a TedX talk? I am so impressed. Could would not in a boat, could not would not with a... Terrifying. Truly. Gigi... let us know how the trip goes. Rooting for you. And thinking today of the fire victims in California. So much devastation. Thanks, Hallie. And I so agree about the heartbreak in California. It seems we are living in an exceptionally challenging time. Hank here: Headed to the airport! What do I need to know? We don't have to do small talk. How are you on string theory? Ann-- you won a Dark Signal from Mysterious Musings but I wasn't able to make a reply directly to your comment. Can you send me your address from www.shannon-baker.com and I'll send the book immediately! Jess, just watched your TED talk. First of all, Go YOU!!!! Standing up to speak in public is scary enough for most folks. Talking about something so personal is even harder, and you nailed it. Then to know it will be forever immortalized on the internet . . . well, that's where even the strongest start to waffle. It was a wonderful talk, and I hope everyone who listens to it finds a way to follow your advice. Isn't she amazing? Jess, if you get a chance, tell us more! Thank you, Gigi and Hank! It really was a new level of terror. I felt it was my duty to give the talk, though, and so I lived with a high level of social terror for the months leading up to the talk, as I went through the training, had my materials proofed and re-proofed, as I researched and practiced that talk literally 100s of times. I really believe we have to be authentic with each other, and we have to share our sad bits along with our good bits (at the right times, with the right people) to help each other along. If we all act like we've got it together, then everybody else feels like they're the only ones struggling. Plus, writing is amazing and accessible healing, and I needed to give back some of what writing gave me. Hank here: Wow, Edith! SO brave! Edith, that's incredible! What an amazing physical (and I imagine mental) feat. Next time I see you, I want to hear all about it. Many of the Reds are in transit to Toronto, so they may be late checking in here! Meanwhile, I wanted to point out something I noticed about Jess and Shannon's adventures: they didn't do them alone! They were supported by friends, family, the writing community, and, of course, each other, as they wend their way through a six-week book tour! And that's the best thing about JUNGLE REDS. The Reds, our fabulous guests, our irreplaceable back-bloggers - we make a community of support. I'm so glad to be here and to be a part of it. Julia, great observation. The support of others who genuinely care about our well being makes all the difference. And, I receive so much support about my blogging and my life in general from those here at Jungle Reds and those in the mystery/crime community. Hugs to you and your beautiful children, Julia. Julia, I'm the latest of the late in checking in! Apologies, but yes, I'm also in Toronto with the best community in the world (and you are here in spirit, of course!). You and Kathy are 100% right: surround yourself with creative, loving people (I like it if they're a little bit silly, too), and everything becomes possible. Julia, we wish you were here, too!!! Hopefully next year. And if you don't come to Dallas the year after that, I will be really really upset! I just realized we will get Gigi to come to Bouchercon in Dallas in 2019--fingers crossed it's not a concert rehearsal weekend for her! Jess and Shannon, so happy to see you here, and I will be looking out for you in Toronto today. But this aversion to driving was really hampering my story possibilities, so the last two trips I've worked out a practical solution (a company that brings the car to you and picks it up again) so that I didn't have to drive in city traffic, and you know what? I actually had fun. I was thinking about that just this morning, Deb. We'll have to make it happen somehow. I think driving in England is huge, Debs. I am hoping to get to England (finally) in the next year or two, and I just don't think I can handle the driving on the wrong (for us) side of the road. Deborah, you are an inspiration! I was in the UK for a research trip/honeymoon in August and I had my husband drive anywhere. I normally love to drive but was paralyzed by the opposite-side-of-the-road thing, and I was disappointed in myself for doing that. But you found a healthy way to deal with it. Yes! Looking for everyone here in Toronto. That TED talk of Jess's is not to be missed! I watched it online. Fabulous! And great to see you in person today, Ann. Ann and Edith, thank you both, and we definitely must spend more time together here! I love this: "Any big chore can be tackled by breaking it into chunks. Commitment and accountability are key. And whatever the journey, find comrades to share, commiserate, and celebrate." So true. Shannon, you made me laugh out loud. Mary, thank you, and thank you for hanging out with us here! The mystery community is the BEST! I really needed that reminder about breaking big chores into chunks. I seem to have too many of them looming. I'm in an emotional slump today. My mom is 97 and spent the night on the floor of her apartment last night. She fell and couldn't get up and couldn't reach the cord to summon help.Security called me sometime after noon to let me know. I spent several hours there trying to make arrangements for morning help for her (she tried it a couple of weeks ago and cancelled. Said she wasn't used to being waited on!) We're trying it again at a more reasonable hour for getting up. I've set up housekeeping to come in twice a month for general cleaning. We ordered one of those alert thingies you wear so you can summon help anywhere IF you're wearing the dang thing. So we accomplished these things yesterday. Me making the calls, her compromising so she can continue to live independently safely. She lives in a very nice senior community and a room over at assisted living may become necessary. She doesn't want it and I don't blame her at all. So, this got way off topic. Jess, public speaking is scary to me but to do a TED talk, wow! And being able to run ANY distance is impressive, much less a half marathon! Congrats, Shannon! I'm so sorry for this. Thanks for trusting us with the story. Pat, I too am sorry for the place you are in. As Ann says in her comment, I've been a Dother and it's not an easy time for either daughter or mother...A note on the alert thingy, my mother select a wristband rather than a pendant and she never took it off. (Can't remember all the details of its waterproofing, but she could shower with it.) May you and your mother have strength and grace for your days. Oh Pat, I'm so sorry for the heartache that you are going through with your mother's decline. I certainly wasn't happy to see my parents pass, but I was glad each of them had only a year or a bit over where they needed caretakers, long road of decline, which, of course, is hard of loved ones as well as the parents. Your are in my thoughts and prayers. Pat, I'm so sorry for what you're going through. I don't think you got off topic at all. You perfectly illustrated how breaking even the most overwhelming task into chunks makes it possible. Please also make sure to take care of yourself. Pat, it's super-small consolation, but you were randomly picked for one of the book giveaways we're hosting on this blog tour. If you could please email me your home address at jesslourey@yahoo.com, I'll get those books in the mail ASAP with an extra dose of love packed in there. Hugs, Pat! Sometimes the best thing you can do is say the chores can wait and give in to that emotional slump. Last week I spent half a day binge watching THE GOOD PLACE. Did I cross anything off my to-do list? Nope. Did I feel better after? Hell, yeah. Thanks. I got home, saw my nextdoor neighbor and invited her over to the front porch for beer. I downed 2 to her 1 and we commiserated over the situation. She went through worse with her dad a few years ago. We also share a construction crew right now while getting repairs done on our houses. Lots of good laughs over that! I have a word for people like Pat who have elderly parents. It is Dother, as in a daughter who is mothering her mother/father. It's a privilege with burdensome overtones. Blessings. Ann, thank you for your word -- Dother. I've just spent a lobby hours with 5/8 of the Reds, had met Deb but first time for Hallie and Lucy/Roberta, Rhys and Hank. My work here is done. So wonderful to see you! You totally made my day! What I have faced is the death of a child, my third son, Eric. He was diagnosed with a brain tumor at seven and he survived ten years. I have faced it but will never conquer. It's the gold standard for loss. Ann, I have no words that could possibly touch this kind of pain. I hope to meet you someday and at least give you a hug. Ann, my heart breaks. We're going to hug for longer next time. And I'll bring some cream for your itchy bee sting. Oh my, Ann. I have no words for this loss. When my father died, my grandmother, who was past 80, was devastated and said there was no greater pain than losing a child. My deepest sympathies to you. Does it count that I fear I will never get to go home from work tonight? When I go to Bouchercon, one of the many lists that I make out is a list of people that I still want to meet and talk to. Shannon and Jess, you were on that list for Toronto, and now with me not being there, the list name will read Bouchercon 2018 People to Meet. I did briefly meet Shannon, but it was such a quick hello that I'm not counting it as an actual conversational meeting. I do admire you both, and that was even before the TED talk and the half marathon. But, having another year will enable me to get myself in gear and read some of your books at least. I am so far behind right now, but there are certain authors that I am on a quest to get to. Who was it that decided on only 24 hours in a day? Kathy, so you're for sure going to St. Pete in 2018? Because yay! We will meet there. Oh, the faced and conquered part. I guess one of the big challenges I had was living by myself. My husband and his father had a furniture-appliance-electronics business, and for decades it was great, but in the late nineties, they had to close (WalMart is not dear to me), and for a couple of years, my husband got extra Army Reserve duty and taught classes for the Reserves. Then, in 2002, he was called to active duty, starting at the Pentagon, and since that time he has lived and worked elsewhere. Our daughter was starting college that year and our son was starting high school, so I stayed home with my son so he could finish out school with his friends. My husband went on to serve at Central Command in Tampa, a tour in Afghanistan, and ended up for his final assignment in Ft. Leavenworth, KS. When he retired from the Army five years ago (or was it six), he stayed in Leavenworth because he got a job with the contractors Northrop-Grumman, and he travels quite a bit with them (going to South Korea in a couple of weeks, which I'm not too happy about). It never seemed a good idea for me to sell our home here and follow him around, what with our kids in only an hour and three hours away from here, and Philip wants to return he when he retires (the end of next June). I never thought that I would or could live this arrangement for fifteen years, with the last ten by myself. I was the girl who when we were first married couldn't go to sleep without Philip here and was afraid to stay by myself. But, sometimes you really can do what you have to do. My husband actually loved being in the active Army and enjoys his job now. He couldn't have made near what he has made by staying in this area. His mother is still here (89) and, as I said, our children are close, so this is the place he calls home and the home to which he will return. I learned to stay by myself, not be scared, and actually enjoy the solitude. I have some great friends who I enjoy doing things with, as well as my family. I have traveled to three Bouchercons and met wonderful new friends. I have taken a couple of other friend trips and visit my hometown, which is four hours away. My husband comes in around every six weeks. Well, the time he was in the accident and got burned badly and was in the Burn Unit for nine days and then came home for a month and a half, that was a longer time. That was a learning experience, too. I can now change a dressing on a badly burned hand like a boss. Anyway, I'm getting off track. The thing is that I learned I could stay by myself and sleep through the night without fear. Now, the challenge will be can my dear husband and I live together again. I think we can. So sorry for the lengthy piece. I just saw how long it is. So glad to learn more about you! Retirement is great. I love time together with my husband who used to be gone 3-4 days each week . Kathy, that is amazing! That is a whole different type of challenge, I can imagine, and you are doing it. What an incredible group of people here at Jungle Red. Big love to you all!